With IBM’s annual THINK Conference now behind us, I’m remembering the people who drive the innovation and disruption we showcase there — the product of collective collaboration, individual leadership, and ideation from IBMers and other thinkers around the world. A perfect example within IBM Data and AI is Serge Bourbonnais, STSM, Database Replication, who has spent over three decades pushing teams to modernize the replication space. I recently had the honor of sitting down with Serge and hearing all about his expeditions around the world, his innate desire to create (ranging from computer science to home renovations to cooking) and his obvious love for his family and children. How long have you been with IBM? I started 31 years ago at the Toronto Lab, but I’ve been at the Silicon Valley Lab (SVL) for about 19 years. IBM was my first job. At the time IBM was taking a lot of interns, by the hundreds, and I remember my interview with the IBM representative really impressed me. For me, it was an honor and a great opportunity to join IBM. I have not been disappointed. In 2000, I was transferred to SVL to work on the Q Replication project and focused on replication for Db2. But the highlight of my life at IBM has been the three international assignments and a residency. Where were your international assignments? A short time in Germany, but mostly China and France, and then California where I finally settled. I'm French-Canadian and felt super lucky to be in Paris from 1998 to 2000. I was in China for two-and-a-half years. I enjoy getting to know how local people live their lives. For activity I walk a lot, often all-day-long and off the beaten paths, taking in the surroundings. I'm normally not interested in tourist spots - unless it's one of the world's Seven Wonders! Or if I have friends accompanying me. I think I went to the Great Wall 15 times! Each time colleagues or friends would visit. 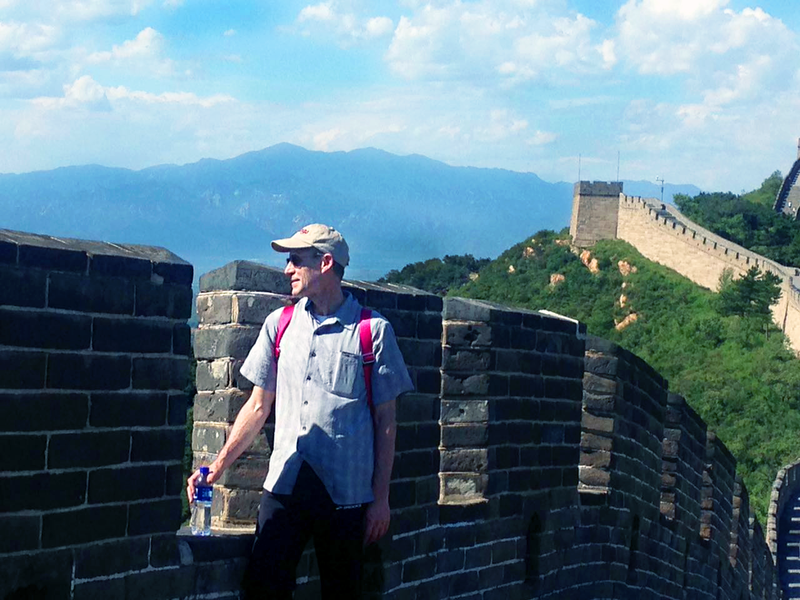 Mid-2012 to the end of 2014, going between Beijing and Shanghai to work at China’s major banks with our team in China. Interestingly, many of the largest Chinese banks share a similar model: the administrative center in Beijing and a data center in Shanghai, and replicate data between Beijing and Shanghai, which is over 700 miles. Is the business culture different there? Definitely, but IBM teams and client teams worldwide have the same culture. They’re really committed and they make things work. You can have a complete solution from IBM and your client team will make it seamless. It’s I believe why we're so successful with large accounts. You were in France, as well? In Paris? That’s right. Paris is such a wonderful place and culture. It’s a city where you can do something different and fun every weekend. There's always something going on, especially if you speak French. There are more plays, movies, museums, and parks than you could see in a year. And my kids were young at the time in Paris. So there's all these activities for children. It's a society that is very oriented toward the children. At the museums, if you have small kids, you can cut the line. If you have a stroller you just go straight in. Even in the Louvre, right in front of everybody! They just open the gates for you. I’m curious about your general work strategy. Over more than three decades in a large Fortune 500 company, have you ever struggled with focus, or persistence? Yes. I like to think that I'm not alone in getting scattered or trying to bite off more than I can chew. My strategy for coping is simple: I trust the people around me. Collectively, the team always pulls it off. We try to lift others when they are down, and they do the same to you. I also strongly believe in the concept of the Wisdom of Crowds, which states that the aggregation of information in a group can yield better decisions than what can be made by any single member of the group. If you could snap your fingers and make something available to every person on earth in order to make their lives more meaningful, what would you give them? Education. Access to knowledge, to books, to public forums, to the sharing of ideas. What’s something you feel optimistic about? My children, and the young generation in general. They are very capable and make me optimistic that we can correct our trajectories for a better future. Technology will be key. Favorite Thing to do on Vacation: Walking! Paris end to end – in one day!